In mid-March, we opened the new Agriculture exposition to visitors in the Prague building of the National Museum of Agriculture. Here, you can find unique collection items including many specimens of farm animals, listen to stories of our ancestors, and learn about the history of agriculture and the cycle of the business year. The exposition’s first prominent feature is César the bull, the best breeding male from the first Czech insemination station. On the other side of the room, you can take a look at an original plough from the Veverka cousins, who initiated an era of new agricultural technology and innovations in the 19th century. 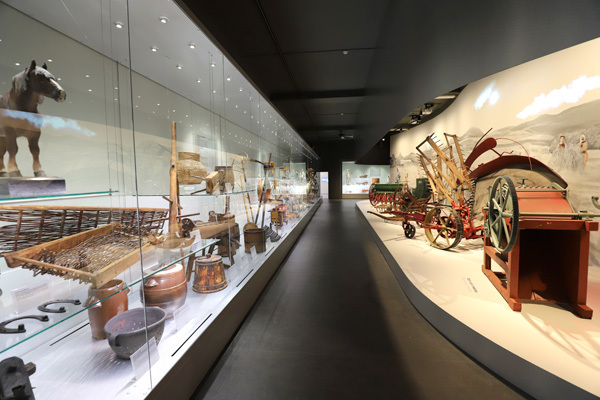 The exposition is also not lacking a symbolic journey through the history of agriculture in the form of a timeline that brings you closer to and summarises the development of agriculture from prehistory to the present day, with all its twists, falls and successes. Agriculture from the Neolithic period represents the foundations of our society, paving the way for the development of other industries, science and technology. Up until the 19th century, the cultivation of soil and breeding of livestock supported the vast majority of the population. A farmer’s year was dependent on the changing of the seasons. For this reason, as the main theme of the exposition we have chosen to depict agricultural work over the course of a year – one farming cycle which repeats itself every year with ironclad regularity. The very youngest visitors can go inside a granary or a shed with a sheep and a goat, and will also find a yard with animals or a room where they can have a go at making bread and meat. The new Agriculture exposition creates a notional core of the presentation concept of the museum building in Letná with its foundation in exhibits thematically focusing on nature and culminating in exhibits devoted to food and life. The exposition was created to mark the one-hundredth anniversary of the National Museum of Agriculture.